The University Hills real estate is considered a jewel of the local Denver area. Homes in the area were built in the earlier part of the 20th century in the 1950's and most of them have their original ranch style architecture and charm. Larger homes have also been built in the area. 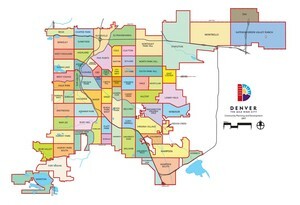 The community's real estate is located inside the boundaries created by the Interstate freeway I-25, Colorado Boulevard, Hampden Avenue, and Yale Avenue. Families can enjoy its tree lined streets while walking to Marnie D. Eisenhower Park, which features a playground, swimming pool, tennis courts and recreational center. University hills also provides quick access to the Highline Canal, which is in close proximity to Eisenhower Park and spans over sixty miles. Just east of University Hills and across Colorado Blvd, is the Wellshire Golf Course, which features 18 holes of golf, complete with driving range. Residents can also take advantage of the three nearby shopping plazas including: University Hills Shopping Center, University Plaza, and Happy Canyon Shopping Center, that feature many restaurants, supermarkets and specialty stores. University Hills residents that want to support their neighborhood can join neighborhood association and other groups that focus on keeping their community healthy and thriving for the next generation of residents.